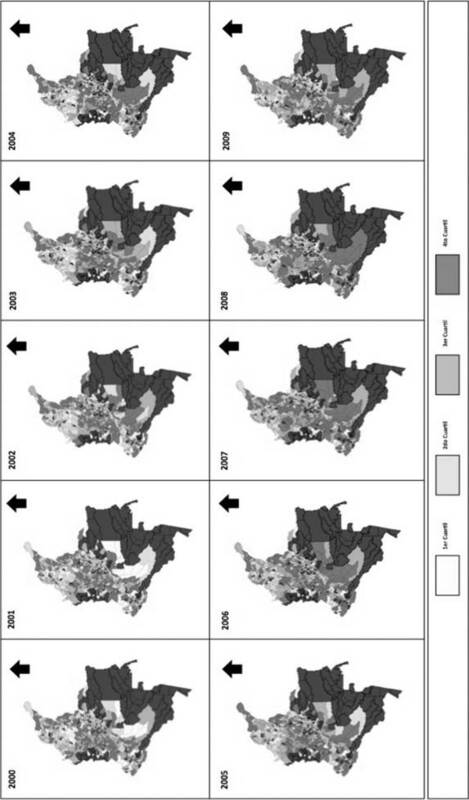 This paper studies the spatial effects of demographic changes, education conditions and conflict situation on the spatial persistence in the municipal homicide rate in Colombia, as a result of shock increases in the displaced population and local residents between 15-29 years old, the education coverage, and the conflict actions. In order to do this, a temporal analysis of homicides rate during 2000-2010 is undertaken through the inclusion of temporal dynamic characteristics in a spatial autoregressive model, a spatial weights matrix was constructed that was based on the distance travelled between near-by municipalities and the departmental capital cities which were defined as centroids, which standardizes the municipal relationship that affects the demographic dynamics and social connectivity of the last decade that affects homicides and their temporal persistence. The results show that in some departments of the country there is spatial agglomeration in homicide rates in nearby municipalities but the spatial shock is low and disappears in time. Population changes due to forced displacement flows, greater density of young population and low coverage in secondary education affect the diffusion and concentration of homicides in Colombia. Este documento estudia el efecto espacial de cambios demográficos, condiciones de educación y situación de conflicto respecto de la persistencia espacial de la tasa de homicidios municipal en Colombia, a partir de shocks en el crecimiento de la población desplazada y de residentes locales entre 15-29 años, cobertura educativa y acciones de conflicto municipales. 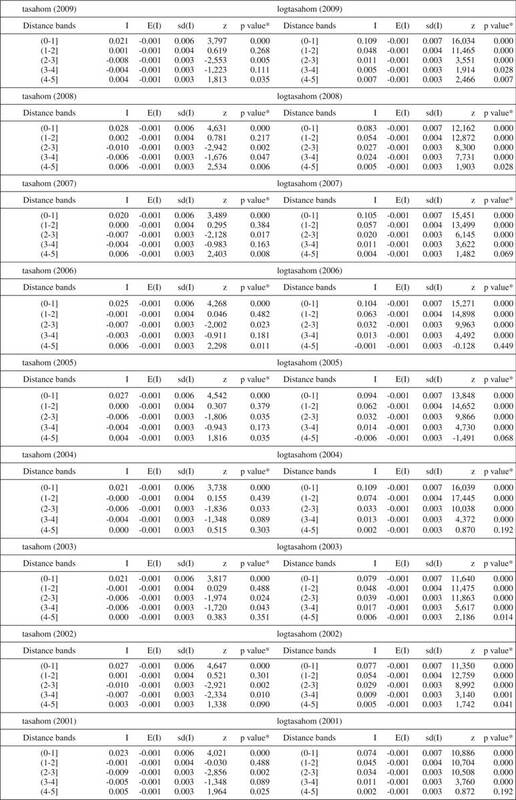 Se propone un análisis temporal de la tasa de homicidios durante 2000-2010 mediante la incorporación de características dinámicas temporales en un modelo espacial autorregresivo, se construye una matriz de ponderación espacial basada en la distancia recorrida hacia municipios cercanos y las capitales departamentales definidas como centroides, que estandariza la relación municipal que incide en la dinámica demográfica y la conectividad social de la última década que afecta los homicidios y su persistencia temporal. Los resultados muestran que en algunos departamentos del país existe aglomeración espacial en la tasas de homicidios en municipios cercanos, pero el shock espacial es bajo y desaparece en el tiempo. Los cambios poblaciones por flujos de desplazamiento forzado, mayor densidad de población joven y baja cobertura en educación media incide en la difusión y concentración de homicidos en Colombia. Criminality in Colombia, as seen by the homicide rate during 1970-1974 was 16 per 100,000 inhabitants and reached its maximum level in 1991 with 89 homicides per 100,000 inhabitants and then presented constant reductions until the year 2000, period in which peace processes were presented, demobilized armed groups and began the democratic security policy that maintained the reduction until 2009 to then present slight increases in recent years. However, the homicide rate remains low compared to previous decades, and in major cities reflects a greater state presence in the prevention of drug trafficking, crime reduction and dismantling of criminal gangs that affect regional security. Despite government efforts to control the causes that generate violence, the distribution of homicides is not isolated or random, on the contrary the most relevant homicides rates are concentrated in some regions and present a persistent pattern associated with the regional internal conflict, leaving aside the demographic dynamics that explain the variation in the homicide rate due to the population link in regional violence activities. Being the above, a reason to study the behavior of the homicides during 2000-2010, a period that presented the homicides rates in the history, forced displacements concentrated in certain regions, increases in population density, low educational coverage and disputes between armed groups that jointly contribute to the spatial persistence of the municipal homicide rate in view of the diffusion of special effects that characterize the regions of the country. It seeks to analyze the relationship between population shocks due to forced displacement, young population pressure and conditions of conflict with the dynamic persistence and prolongation of municipal homicides in a period where the demographic transition of the young population coincided with the increase of insecurity and homicidal violence (Villamor, Chavarro, & Caro, 2009), (Sandoval, 2014), (Bonilla, 2010). The results are useful to show that homicides do not necessarily relate to conflict conditions and tend to accumulate in regions of the country where there is a greater concentration of young population, which makes it possible to compare the effects of propagation between neighboring areas on the basis of the local conditions of the regions in terms of population, education and conflict (Valencia & Sanz, 2016). The paper uses municipal data on education, income and displaced population supplied by DANE (National Administrative Department of Statistics), conflict actions and crimes by municipality given by Conflict Analysis Resource Center (CERAC). The variables used are constructed following the stylized facts that are referenced in the previous section that serve to answer the research question and to approximate the effect of the variables on the spatial persistence of homicides. 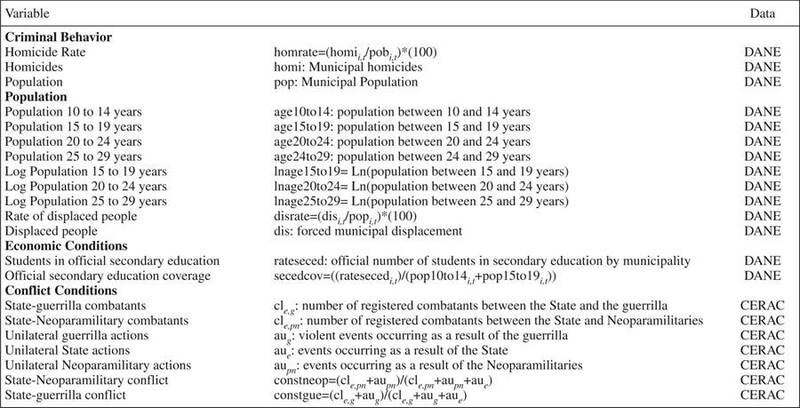 Furthermore, this paper seeks to answer the following question: ¿Do the demographic changes in the population displaced by the internal conflict and changes in the local population of citizens aged between 15-29, together with economic conditions in the municipalities explain the persistence and spatial diffusion of homicides? This question is important because of the dynamics of the resident and displaced population that is affected by the local and neighboring environment, especially when the homicide rate of the last decade has declined significantly compared to the 80s and 90s, where the country faced different types of violence associated with drug trafficking and armed conflict that promoted social disorder and increased the propensity for criminality. In order to answer this question, spatial lags were included in the dependent variable and in the error term as was a matrix of municipal distances that standardized the link municipal residents have with near-by municipalities and the departmental capital cities, which were defined as centroids. These standardized the municipal link by closeness or proximity, which was used in a panel with the fixed effects of lags and spatial autoregressive (SAR) errors in order to show if the variations in spatial demographics, economic conditions, and conflict affect municipal homicides. The results show that an increased temporal persistence in the density of the young population, the receiving of displaced people and actions resulting from the conflict can explain the homicide rate and its behavior in nearby regions. The coefficient for the spatial dependence is low but significant, which indicates that the shock of spatial contagion is present, but diminishes over time. Section 2 presents the literature review of criminality in Colombia and the spatial persistence associated with crime. Section 3 describes the methodology, the theoretical model, the weights matrix, and the data used. The Section 4 presents the results, which are used to draw conclusions in Section 5. Based on theoretical concepts of criminal behavior, (Montenegro & Posada, 1994) point out that the increase in criminality during the 70s and 80s arose from the growth of productivity in the country, the increase in social wealth, and weaknesses in the judicial system that incentivize criminal behavior (Sánchez & Núñez, 2001). (Sarmiento Gómez et al., 1999), meanwhile, have found that the education level, political participation, and level of equality affected the variation in homicide rate in the years between 1985-1988 and 1990-1996. In contrast to the previous research, (Echandía, 1999) has studied the geographical distribution of violence and points out that the municipalities with a higher homicide rate are not spread over the country, but are indeed centered in certain areas. The number of municipalities that are prone to having a higher number of homicides increase as the factors that generate violence themselves increase. In studies that disagree with others on the subject, (Rubio, 1999), (Rubio, 2001) states that violence is not a result of poverty or regional inequality. For this author there are only a small number of homicides in regions with high levels of poverty, which seemingly by coincidence have low levels of violence. He, in turn, affirms that regions that have more favorable poverty indicators, that are better developed, and that have a more complete education coverage are more violent than municipalities in which there is a higher presence of armed groups. Based on this position, (López et al., 1999) state that poverty itself is not a cause of violence, but inequality is, particularly when there is social exclusion that only benefits one sector of society and there are incentives for the evolution of drug-trafficking. This causes a downward spiral of delinquency in which the drug trade and sale of drugs prolongs the violence (Gaviria, 2000), (Montenegro, Posada, Piraquive, & Martínez, 2001). According to the authors, such organizations generate patterns of dispersion that facilitate the persistence of violence in fragmented regions. This is caused by low levels of state presence and judicial inefficiency, which contribute to the spread of criminality (Cohen & Tita, 1999). Homicides that involve dynamics resulting from armed groups that self-finance by drug trafficking and violence that arises between persons involved (Steiner, 1997), (Rocha, 2000) can be counted as being part of this criminality. Moreover, crimes such as homicides show persistence and spatial diffusion as a consequence of the lack of justice and the presence of drug trafficking (Sanchez Torres, Diaz Escobar, & Fornisano, 2003). However, in the country’s cities (Restrepo, Moreno, & Villegas, 2006) there are some measures that contribute to the reduction in homicides, although variables that are associated with the spatial and temporal dynamic have a positive and significant impact on the homicide rate (Sánchez, Espinosa, & Rivas, 2003). Moreover (Howe, Sánchez, & Contreras, 2010), claim that the demobilization processes of paramilitary groups reduce the number of homicides in the areas in which they have an armed presence. However, in the areas in which there is a higher population density, the probability of there being higher municipal homicide rate is increased. Due to this, it is important to consider the density demographic and the size of the young population, which is more vulnerable to the prolongation of periods of violence that can affect the life expectancy of inhabitants as well as the quality of schools and children and young people’s attendance (Rodriguez & Sánchez, 2012). The previous studies suggest the existence of spatial persistence in crime indexes. This gives reason to study the literature that addresses the temporal effect in demographic systems from population shocks that continue and remain over time (Azomahou, Diebolt, & Mishra, 2009). This focus helps to explain future patterns in regions that are affected by characteristics that only remain temporarily. As such, the transition in a variable such as the homicide rate that depends on the economic cycle (Romero, Herrera, & Espitia, 2011) can be explained by demographic movements associated with the structure of age groups that determine present and future decisions (Boucekkine, De la Croix, & Licandro, 2002). This is important in order to show how demographic changes have an influence on regional development and growth (Lindh & Malmberg, 2007), particularly when the conditions of the young population are affected. Therefore, when using a panel to capture the spatial autocorrelation between regions located close together and maintaining heterogeneous individuality, it is possible to obtain an unbiased estimate of the dependent variable (Anselin, Le Gallo, & Jayet, 2008), (Baltagi, 2008), (Baltagi & Li, 1992),(Baltagi & Li, 2006), maintaining a disturbance component that not only shows an spatial autoregressive (SAR) parameter associated with the weights matrix, but also an error term with independent distribution (Anselin, 1988), (Anselin & Bera, 1998). It should also be noted that the weights matrix W* is symmetrical and presents binary outcomes that relate to neighboring and non neighboring elements, as well as diagonal elements are zero in order to have robustness (Moscone & Tosetti, 2011). These types of models are made by maximum likelihood estimation (MLE) or by generalized method of moments (GMM). This last method uses moments to take advantage of the properties of the error term and the estimation resolves the problem of nonlinear optimization, which can be found in the specification (Lee & Liu, 2010), (Lee & Yu, 2010), (Lin & Lee, 2010). It has the advantage of obtaining consistent estimators that keep regularity conditions and low variance of unknown heteroscedasticity, which prevails when the diagonal elements of the weighs matrix are zero. 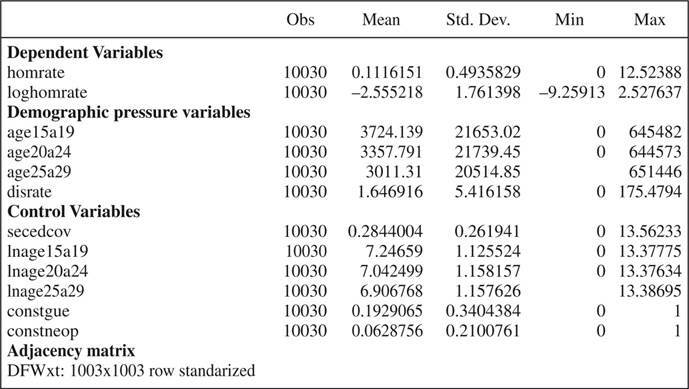 The results hold when the SAR model is estimated with superior order spatial lags and homoscedasticity error (Kelejian & Prucha, 1999). (Arellano & Bond, 1991) constructed estimators for dynamic estimation with equations from the lag moment in the dependent variable and differences in error. However, when the autoregressive process is persistent the lags are weak instruments. Equally, (Arellano & Bover, 1995) and (Blundell & Bond, 1998) propose an orthogonal moment condition between lag differences in the dependent variable and error values that present a bias due to the size of the time series. In order to control the bias in small samples for dynamic panels when the autoregressive coefficient is close to one (ρ= 1), (Phillips & Han, 2008) and (Han & Phillips, 2010) propose a specification with fixed effects and a trend in the autoregressive coefficient. 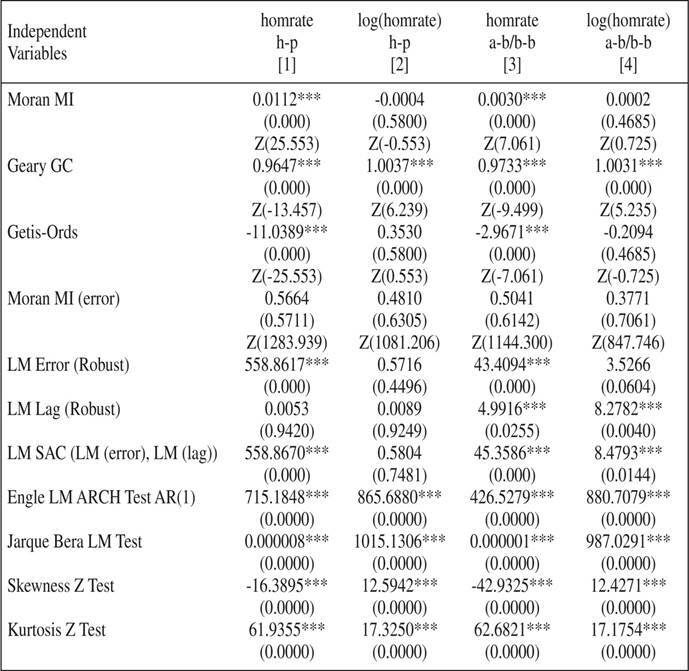 This paper uses GMM estimations for a data panel with fixed effects, unknown heteroscedasticity, and spatial autoregressive (SAR) errors. Also, (Han & Phillips, 2010), (Arellano & Bover, 1995), and (Blundell & Bond, 1998) use specification to study the spatial effect on persistence in the homicide rate for demographic changes given displacement flows and increases in the young population (15-29 years) together with the education coverage and conflict variables. To estimate demographic changes in municipalities, a spatial matrix was constructed by municipal proximity that relates the distance traveled from a municipality to the main departmental capitals that are defined as centroids1 and also from near by municipalities. This defines relationships between the distances travelled between neighboring municipalities and departmental capitals in order to show a proximity criterion for social links contained in a square matrix that is defined by the kilometer distance between municipalities. This represents social networks in the decisions to change place, which function to be able to determine the spatial weights matrix (Anselin, 1988). The W* matrix the size of which is 1003 x 1003 represents the distance in kilometers of the municipality in row (i) from the municipality in row (j). These municipalities include 25 centroids (c), which represent Colombia’s departmental capital cities and only when the column and row contain the same municipality there is a distance value of zero. The weighting criterion, which spatially connects municipalities by geographic distance according to the distance travelled to near by areas and centroids is established based on the distance matrix. areas. This means that the spatial weights matrix reflects interaction patterns that are defined by the W* values. As such, the matrix will be exogenous (Kelejian & Piras, 2014) with respect to the dependent and explanatory variables. Where, the dependent variable yit is the municipal homicide rate (homrate) for a period of 10 years and has stable behavior. It can also be established if the homicides have a random distribution or if there is a positive spatial autocorrelation associated with the control variables xit for demographic pressure (age15to29, age20to24, age25to29, disrate), economic reasons (secedcov), and actions resulting from the conflict at a time when they could spread to near by municipalities (constgue, constneop). The error component has spatially autocorrelated residuals (SAR), which transmit global shocks to the entire system (Anselin et al., 2008) (2). Spatial dependence appears when the effect takes place in the dependent variable or in the error. As such, the spillover effects are considered to be those from which multi directional diffusion arises from the behavior of the variable for regions that could be affected by a near by region or by a centroid. The spatial weights matrix W* indicates the systems spatial connectivity with each element wit as well as the observational unit i, which is spatially connected with j. Those elements that are different from zero reflect interregional spatial interaction where |ρ|<1 indicates the spatial intensity autocorrelation with the error, vt is the error vector (Nx1), which is independent between cross sections that have constant variance The error covariance matrix is , where ιt is an all ones vector (Tx1), the error term is the convergence matrix , is an all ones matrix when , . These tests establish if the values in the homicide rate are similar in adjacent and neighboring regions under the spatial independence hypothesis and define proximity criteria through the spatial weights matrix W*. For estimations, the tests for spatial autocorrelation of the error Moran’s I and Geary GC present significant values and positives between 0-1, which indicate direct autocorrelation or similarity between the values obtained in closely located regions, thus the high/low values for the homicide rate spatially group together with others. The results obtained show that with a low spatial agglomeration and when the regions have similar behaviors (Getis-Ords) the coefficients are close to zero and one (Moran’s I and Geary GC). This reflects the low spatial autocorrelation and hold the spatial randomness hypothesis. In the a-b/b-b case (Arellano & Bover, 1995), (Blundell & Bond, 1998), the robust LM lag coefficient is less significant than the robust LM error, being appropriate to use the estimation with a spatial lag and models with spatial error that consider leaving out variables (Anselin & Florax, 1995), while maintaining spatial dependence for error and the dependent variable. 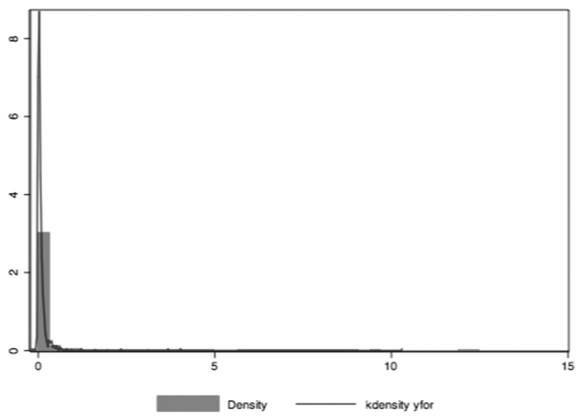 The results confirm that there is spatial correlation in the error. The LM SAC test manifests that there is general spatial autocorrelation for changes in the population resulting from flows of displaced people, a reality that influences the spread of homicides in regions affected by actions resulting from the conflict, density of young population, and low secondary education coverage. The spatial dependence coefficient ρ in every case is low. As such, a spatial contagion shock more quickly disappears in time due to the low diffusion and concentration level of homicides. All the variables associated with demographic pressure (disrate, age20to24) and disputes between armed groups (bdestparneo) are significant, with the exception of secondary education coverage. The lag and the coefficient ρ are significant and confirm the hypothesis that there is persistence in the homicide rate as a shock has effects over time. The low spatial dependence and the nonexistence of spatial clustering shows that no proximity relationship can be seen in terms of the pressures resulting from the size of the population caused by displacement that has an influence on the spread of the homicide rate. Additionally, the model presents the lowest values of maximum likelihood in absolute value AIC (error) and HQ, which is an appropriate representation to show that the homicides are not particularly persistent over time. Equally, spatial diffusion from one municipality to another cannot be seen for the past decade, however there is a low regional concentration of homicides which is due to the regions characteristics. With the proposed dynamic spatial panel in the model, the prediction for the homicide rate is made for a one period of time following (Baltagi & Li, 1992) and (Baltagi & Li, 2006) with the purpose of explaining if the spatial autocorrelation arises by pressures in the density of the population. The diverse municipal conditions in terms of the local young and displaced population who migrate to near by regions due to the presence of armed groups is taken into consideration. As such, the prediction considers the spatial autocorrelation given for near by regions and the individual regional heterogeneity that is created by the associated dependency to location and distance. The previous, which exists is in a geographical context, relates municipalities through the flows of displaced people that are established in the spatial error and includes a spatial autoregressive (SAR) component. The analysis includes data on young people (between the ages of 15 to 19, 20 to 24, and 25 to 29) that comes from each region together with the rate of displaced people (sd=5,41), as well as the official secondary education cover [0,28 (sd=0,26)] and the disputed balance between armed groups and the state [0,19 (sd=0,34); 0,06 (sd=21)]. This helps to show how the population characteristics, the education situation and the presence of armed groups can influence homicides given regional conditions. 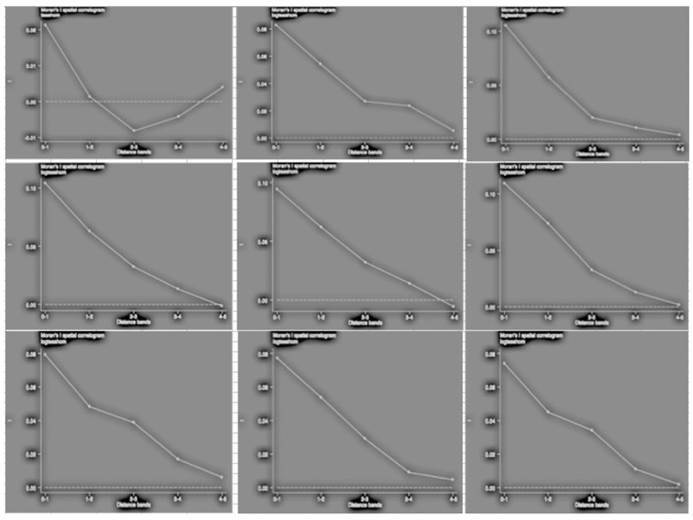 The results show that when making the prediction, the predicted (fratehom) variable follows the same pattern as the real homrate variable, which shows the highest values for the municipalities2 that were characterized in 2010 for having the highest homicide rate and the lowest values for the municipalities with the lowest homicide rate3, corresponding to the last decile. 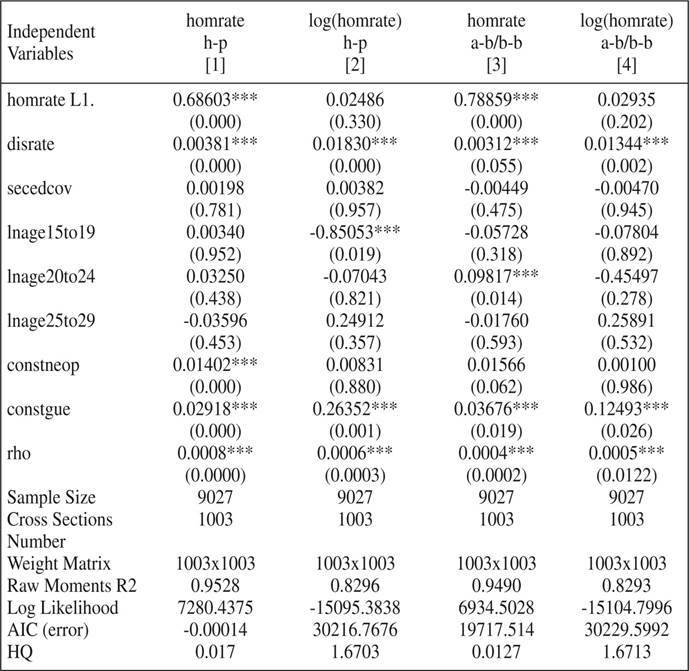 The estimated variable for the model (homrate) follows a similar distribution to the initial variable (homrate), which presents the highest values in specific regions. This explains that the distribution only accumulates in determined percentiles and presents greater variety and standard deviation between regions, this being a reason to consider that the spreading of the homicide rate has a tendency to be concentrated in the same regions over a period of time. When the estimated variable is compared with the real variable it is found that the values do not present large differences, given that the model considers spatial autocorrelation and individual heterogeneity between municipalities. The simple model presents a good performance in the prediction of the variable over a period of time and shows less difference between the real value and the estimated value. Also, the spatial correlation functions to improve the prediction for the highest values of the homicide rate. The analysis on the prediction of the homicide rate using panel data with spatial autocorrelation for forced displacement to near by regions with individual heterogeneity shows a good performance in the distribution of data obtained in accordance with the specification (Arellano & Bover, 1995), (Blundell & Bond, 1998). These results can improve to the extent that the variable presents less dispersion. Spatial autocorrelation improves the prediction, although the individual heterogeneity increases the difference in the prediction that is controlled in the size and robustness of the sample as well as with the structure of the spatial error, the spatial autocorrelation improves the prediction. Taking this into consideration it is possible to consider lags of the dependent variable and the effects of regional proximity as a result of the matrix of displacement flows. The results support the notion that spatial dynamics that have a demographic impact on the homicide rate have spatial persistence due to geographic, economic and municipal conflict conditions. This allows for the behaviors of the homicide rate to be compiled in regions that could be affected by the spatial diffusion of the closest regions. The analysis realized, suggests a relational matrix based on flows of municipal displaced people who migrate from regions affected by the internal conflict between armed groups to near by regions. This shows that there is positive spatial autocorrelation between near by regions in terms of the values presented in the homicide rates. In any case, when presenting relationships of invariant proximity, the spatial significance of the variables can improve and consequently change the structure of the matrix. In general, it is found that the variables associated with the demographic variation and disputes between armed groups are significant and they affect the homicide rate by the variation in geographic distance. As such, the effect of the past homicide rate has persistent and significant results. It has the greatest effect when the size of the local young population is used as a variable, and it leads to an important conclusion associated with population density, which can have an influence on delinquent activities and homicides. This paper was part of the INV-ECO-1486 research project entitled, “Dynamics of juvenile homicide in Colombia between 1990-2013”, and was financed by the Office of the Dean for Research of the Universidad Militar Nueva Granada. Thanks should be given to the Office of the Dean for Academic Affairs at the University of Chile who allowed for my academic stay during my doctoral research at The Conflict Analysis Resource Center (CERAC). The author thanks the reviewers for their very helpful comments on earlier drafts of this manuscript. 2 Matanza (Santander), Tibú (Norte de Santander), San Carlos (Antioquia), Contratación (Santander), San Rafael (Antioquia), Granada (Antioquia), Angelópolis (Antioquia), Beltrán (Cundinamarca), Morelia (Caquetá), Puerto Santander (Norte de Santander). 3 Zapayán (Magdalena), Floresta (Boyacá), La Pintada (Antioquia), Nariño (Nariño), Arroyohondo (Bolívar), Tununguá (Boyacá), Hatillo de Loba (Bolivar), San Jacinto del Cauca (Bolívar), Rio Quito (Choco), Río Iro (Chocó). 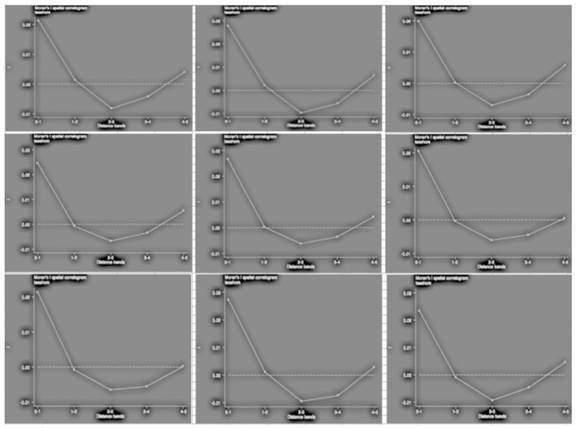 The dynamic panel with fixed effects and a suggested incidental tendency has the advantage of providing GMM estimators that control the problem under weak moments conditions that usually alter the GMM estimators when the autoregressive parameter is close to one. 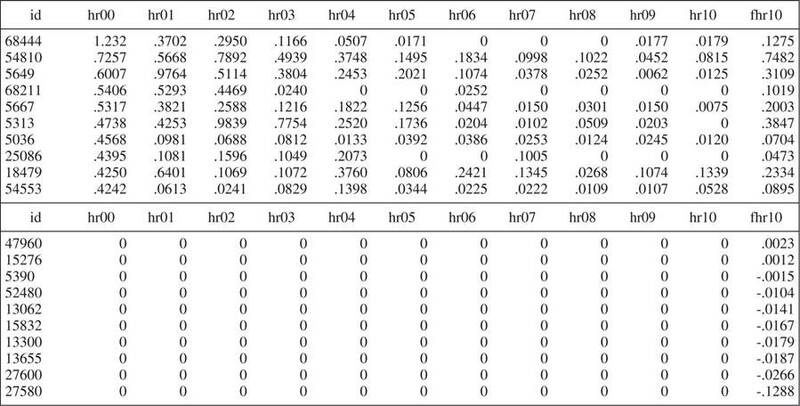 This provides consistent estimations and corrects the bias in small samples that are affected by heterogeneity and error dependence in the cross sections (Arellano & Bover, 1995), (Blundell & Bond, 1998) use model equations and their differences as a system that introduces more instruments and makes estimation more efficient by using the original model equations in levels and comparing their differences. In order to obtain an estimation with asymptotic properties (Blundell & Bond, 1998), consider an additional condition that is fulfilled when yit is stationary in a way that it is necessary to add linear moment conditions for the difference GMM. This allows for the use of lags in the first differences of the series as instruments for the equation in levels (Arellano & Bover, 1995), when Zi is the matrix of instrumental variables for equation in first differences. The system accomplishes a combination of first order difference equations with lags as instruments and an additional lag first order difference equation for the instruments (6).